As your interest in whisky increases, you will slowly approach a specific moment in your journey. Sometime after serving your first dram, you’ll realise that the few lonely bottles you started with have become a somewhat sizeable collection. Like any collecting hobby from stamps to cigars, it’s important to organise it and know how to proceed. Whether your stash consists of two bottles or twelve, whisky is an investment that you’ll want to preserve. Furthermore, you may want to start collecting whisky but you haven’t figured out where to start. In this guide, we’ll cover the basics to starting a whisky collection and how to properly build it out. Either use the links to jump ahead or scroll down to read it all! … Whatever aspect of Scotch whisky calls to you, there is a universal truth: you, my friend, are, or will be, a collector. So let us discuss how to procure, store, and pour your single malt collection. Here's how I got started. Using Bespoke Unit's guide, I truly started my whisky journey. Whisky Collecting Guide Reviewed by John C. on April 30th . Before simply jumping in and buying all the bottles you can find, the best way forward is to learn about what’s available beforehand. By informing yourself on the various distilleries and their characteristics, you’ll be able to build out a varied collection with tipples that you enjoy. Personally, I prefer to try new expressions by the finger and not by the bottle. So, the best advice is to become familiar and friendly with the dramslingers at your local whisky bar. Any pub may do but ones known for their whisky collections tend to keep more of the best stuff on hand, stored properly. I often work with Mike & Chris at my favorite bar to find new things to try. Having a chat with them lets me know what people are drinking and what the feedback has been. Note that being a nice, well mannered, respected regular at a whisky bar often leads to complimentary samples, special orders, and heavy pours. Plus nothing beats a tipple in a room where everybody knows your name. Certainly, we at Bespoke Unit have a bias towards our own reviews and distillery profiles. We put in the extra legwork to assure you can easily find what you are looking for. Should you wish to branch out beyond our archives, check out WhiskyCast, a podcast with more than a decade of tenure. Founder Mark Gillespie provides what he dubs as “cask strength conversation” each week. This includes interviews with blenders, reviews of bottles, and news from around the world. Those of us who enjoy leisure travel or conduct international business generally relish the opportunity to fly. As with Scotch consumption, we have a ritual; we understand the nuance of the experience and find joy in it. For me, one of those joys happens to be shopping for whisky at the duty-free shop. A wonderful expression not available in the U.S.; Golden Cask is aged in oak and then golden rum casks giving it a fantastic nose and sweet, crisp, mouthfeel. Bottled at 47.5% it is such a well-balanced dram. You will not regret seeking this out. Blended as a tribute to its own legacy, this expression, aged in first fill bourbon casks and finished in European oak hogsheads, this perfectly exemplifies the Laphroig lineage. Almost any traveler will agree that duty-free shopping is more about rarities than beating the local tariff. Sometimes, modern technology does lead to a bit of burnout. In fact, one of the reasons I began enjoying my Scotch ritual was to get away from screen time with a good book. And what better way to learn about Scotch than to drink it and read about it? Jim Murray is a powerhouse, tasting thousands of different whisky expressions each year. Each year he rates, ranks, and decrees the best whiskies in the world. More than 4,000 tasting notes on the world’s top distilleries and their whisky expressions, the Whisky Bible is a must-have. You should obtain this annually as each revision has a mountain of information and can be a great place to find a new bottle. You can buy Jim Murray’s latest bible for as little as $14.62 on Amazon! 2017 marked a decade since the whisky world lost the King of Pop. However, in his short 65 years he became an authority on both Whisky and Beer; authoring over 16 books and countless additional media content. The Malt Whisky Companion provides all of the knowledge you need to begin a whisky journey, including a look at the areas of Scotland, main distilleries, and major drams. Since Michael’s passing in 2007, a revision was produced in 2015. It was was completed by Dominic Roskrow (author, former editor of Whisky Magazine, and Keeper of the Quaich) and Gavin D. Smith, renowned author of more than a dozen books on Whisky. You can find the 7th edition of Michael Jackson’s Whisky Companion for just under $20 on Amazon. You can see here that with a small investment of time and capital you can quickly have a powerful knowledge bank. Now that we have discussed how to suss out what you want, here is how to buy it. Afterall, collecting whisky requires you to purchase a bottle or two. Local dram laws notwithstanding, the best to place to buy a good bottle is always your local dram shop (State store, liquor store, or however it is defined in your hometown). Get familiar with the clerk and you will get the inside track on what is coming. Marvin at my local State store has been a fount of information as well as a good ally in assuring some new things are kept aside until I can get there to pick them up. It is amazing the types of friendships you can strike up from just asking a few questions and being courteous during your visits. Please do find your own Marvin! The result will be fantastic. “Life is too short to drink bad whisky”, Love Scotch’s mantra and one that resonates with all of us. Touting itself as the U.S.’ most comprehensive online retailer this site has an incredible selection including a section dedicated only to rare and vintage expressions. One of the other nice features here is that they sell additional spirits, wine, and craft beer. So you can always pick up a little something for your guests who may not be into single malt. Probably the most comprehensive and well known global retailer of spirits, MoM has everything. So whether you want to purchase the entire Balvenie DCS Compendium (a history of David C. Stewart and his 5 decades blending for Balvenie) for a cool USD $68,000 or simply grab a stalwart Dalwhinnie 15 year at a more modest USD $45, you can do it all. For those new to Scotch or just looking to expand your palate, Master of Malt provides an incredible assortment of curated tastings. Starting at around USD $30 you can experience some of the best whisky in the world without the commitment of an entire bottle. Quite useful for planning out where you would like to invest in your collection. To learn more about tasting, head to our guide to serving Single Malt Scotch. Collecting Scotch is fun. It has a bit of romance and nostalgia to it; harkening to the Hollywood image of a dusty study adorned with leather chairs and surrounded by dark cherry wood shelves. The sort of place where a scholar may sit and pour over an historic novel while also pouring himself a dram. Below are a few key things which should be considered when displaying or storing your Scotch collection. Does Storing Scotch Make It Older? Before diving too deep, we have to address a popular misconception. No, storing a 12-year-old Scotch for 40 years does not make it a 52-year-old Scotch, nor does it impart any additional benefits. So, that bottle of Crown Royal your dad had in the 1970’s looks cool but it is not worth much more than the conversations it will start. What Causes Scotch Whisky To Go Bad? Collecting whisky is certainly fun but can quickly become an annoyance if you go pour a dram one evening only to find that your whisky does not taste like it did when you first opened it. 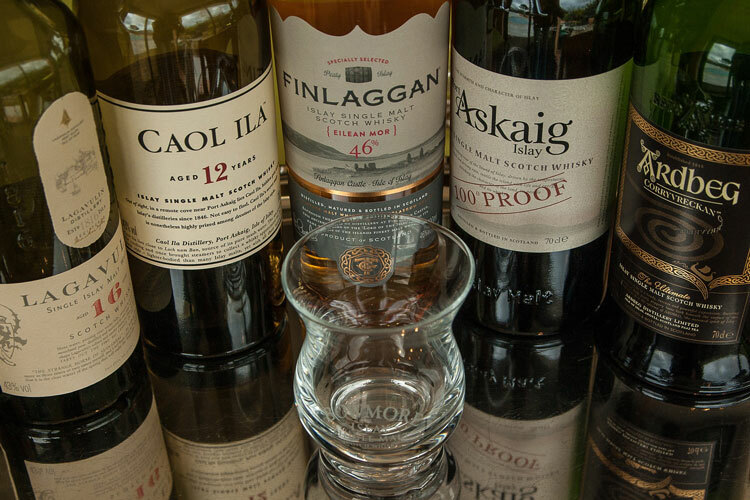 Below we address all of the “must knows” about collecting Scotch. Sunlight is the number one killer of spirits and ales worldwide. The ultraviolet light of our sun is a detriment to the molecular base of our drams causing tannins to breakdown and essentially “skunk” the whiskey. It will lessen in color and oxidation will accelerate. While the effects will not occur as rapidly as they do in beer, storing your collection in a sunny area will degrade the taste, aroma, and color until your whisky expressions are no longer enjoyable. According to the Scotch Whisky Association, which governs the production and integrity of Scotch Whisky, so long as there is no direct sunlight, your bottle will store indefinitely. They note that keeping a bottle stored at a low temperature may create a ‘chill haze’ and cloud your whisky. Though this will disspate once the bottle comes to standard room temperature. I prefer to store my whisky around 60 – 68 degrees Fahrenheit (15-20 degrees Celsius). For ease of use, go by the colloquially accepted definition for whisky storage: a cool, dark, dry place. Remember, whisky is not susceptible to fluctuation like wine. Just keep your bottles comfortable. Just like temperature, there is no need to be overly cautious about humidity levels as you would when storing wine or cigars. Scotch tends to be comfortable in a dry place but it does not need to be arid. Anywhere from 40 – 60% relative humidity is fine. Be wary of going north of 70% less you run the risk of mold growth on your labels/corks/storage racks. Air, more specifically oxygen, is a big killer of spirits. If you open a bottle of whisky, it will last indefinitely so long as it remains majority full. If a bottle is under half full, consider finishing it within the next 6 -12 months to avoid any major changes in flavor. Now you know that air can ruin a whisky so you will obviously understand why a bottle should always be stored upright– it reduces the surface area of the liquid and minimizes the amount of atmosphere on your whisky. Less air = less chance for oxidation. Unlike wine or Champagne, which may benefit from liquid touching the cork to prevent it drying out. Whisky bottles are a gentler but stronger ecosystem where slight evaporation will occur to keep the cork moist but not enough to ruin the bottle. Bottles are heavy, make sure the shelving is strong. If going vertical, secure it to a wall or anchor the legs to the ground. I can envision nothing as sad (and messy!) as a toppled collection. If storing long term, consider doors or another way to keep dust off of your bottles. Light is no friend to spirits. If you want to build a bar with under-mount lighting to “show off” your bottles, assure the lights are not UV emitting. Otherwise, you will ruin your collection quite quickly. If you have children or just thirsty friends, consider putting a lock on your stuff. Should I Decanter My Whisky? We are often asked about decanting as a preservation method. I can definitively say this is not effective nor wise. If you wish to decant for short-term needs, say for your next night of cards with the lads, do it. If you want to preserve Gordan & McPhail’s 34 Year Coal Ila 1981 bottling, keep it in the box, out of the light, and away from the lads. You can learn more about our thoughts on decanting here. There are a few versions of this, with the Coravin being the most widely known. The system uses a needle to penetrate a cork and take wine out of a bottle. This can be applied to Scotch as well. There are certainly expensive and complex systems which handle the task but the Private Preserve is the easiest and most affordable. This type of system places inert nitrogen gas into the bottle to prevent oxygen from actually hitting the liquid inside (flashback to science class- oxygen is lighter than nitrogren). A can of this is an inexpensive way to assure the integrity of bottles which you plan to sample but store long-term. If you are anything like us, you will quickly find that you lose track of your ever-evolving Scotch collection. One of the best things you can do is to get serious about your record keeping. It makes collecting whisky so much easier. A fun little app, Drammit allows you to take notes and track your collection. Available on both iOS and Android, it is clean and simple. Spreadsheets still make the world go ’round. Click here to download a free template built by Bespoke Unit [coming soon]. What Else Should I Know About Collecting Whisky? To which expression are you referring?